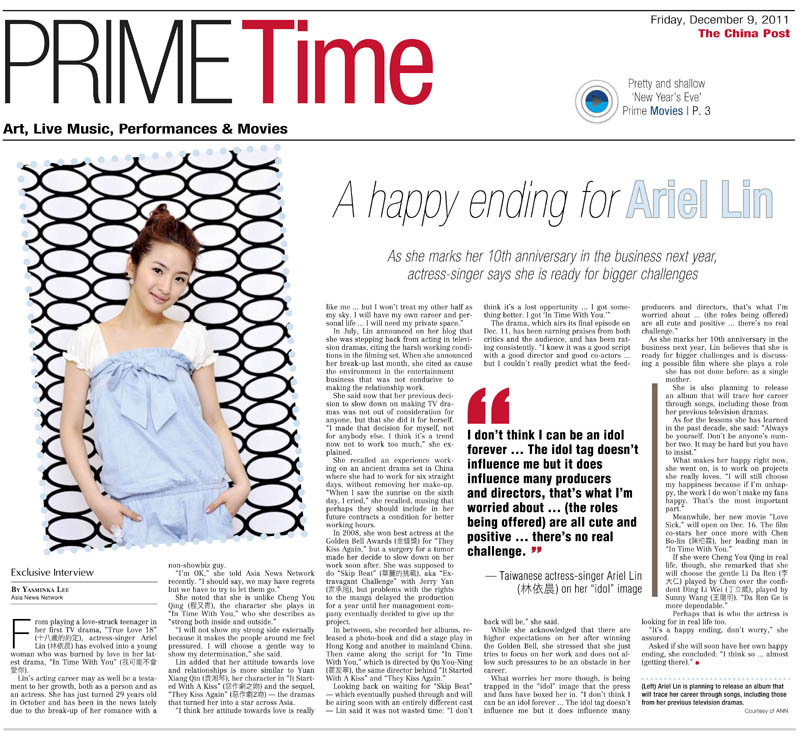 I’ve been busy with many things I forgot to check if my article on Ariel Lin came out on The China Post today. They don’t upload the features section online so I had no way of knowing. I only confirmed tonight when my friends in Taipei told me it came out and a colleague sent me the PDF. I didn’t realize it’s this short. The previous articles I have written for CP took the entire page. Since the newsprint is hardly readable, I’m reprinting the article from The China Post below. From playing a love-struck teenager in her first TV drama, “True Love 18” (十八歲的約定), actress-singer Ariel Lin (林依晨) has evolved into a young woman who was burned by love in her latest drama, “In Time With You” (我可能不會愛你). Lin’s acting career may as well be a testament to her growth, both as a person and as an actress. She has just turned 29 years old in October and has been in the news lately due to the break-up of her romance with a non-showbiz guy. “I will not show my strong side externally because it makes the people around me feel pressured. I will choose a gentle way to show my determination,” she said. Lin added that her attitude towards love and relationships is more similar to Yuan Xiang Qin (袁湘琴), her character in “It Started With A Kiss” (惡作劇之吻) and the sequel, “They Kiss Again” (惡作劇2吻) — the dramas that turned her into a star across Asia. In July, Lin announced on her blog that she was stepping back from acting in television dramas, citing the harsh working conditions in the filming set. When she announced her break-up last month, she cited as cause the environment in the entertainment business that was not conducive to making the relationship work. She said now that her previous decision to slow down on making TV dramas was not out of consideration for anyone, but that she did it for herself. “I made that decision for myself, not for anybody else. I think it’s a trend now not to work too much,” she explained. She recalled an experience working on an ancient drama set in China where she had to work for six straight days, without removing her make-up. “When I saw the sunrise on the sixth day, I cried,” she recalled, musing that perhaps they should include in her future contracts a condition for better working hours. In 2008, she won best actress at the Golden Bell Awards (金鐘獎) for “They Kiss Again,” but a surgery for a tumor made her decide to slow down on her work soon after. She was supposed to do “Skip Beat” (華麗的挑戰), aka “Extravagant Challenge” with Jerry Yan (言承旭), but problems with the rights to the manga delayed the production for a year until her management company eventually decided to give up the project. In between, she recorded her albums, released a photo-book and did a stage play in Hong Kong and another in mainland China. The drama, which airs its final episode on Dec. 11, has been earning praises from both critics and the audience, and has been rating consistently. “I knew it was a good script with a good director and good co-actors … but I couldn’t really predict what the feedback will be,” she said. While she acknowledged that there are higher expectations on her after winning the Golden Bell, she stressed that she just tries to focus on her work and does not allow such pressures to be an obstacle in her career. As she marks her 10th anniversary in the business next year, Lin believes that she is ready for bigger challenges and is discussing a possible film where she plays a role she has not done before: as a single mother. She is also planning to release an album that will trace her career through songs, including those from her previous television dramas. Perhaps that is who the actress is looking for in real life too. “It’s a happy ending, don’t worry,” she assured. Oh! I’m soooo excited to see her play the role of a single mother, I hope that film pushes through. I think she’s more than capable of handling such a role. As a fan who have watched, most, if not all of her movies & dramas, I’m thrilled to know of such possibilities. I’ve watched her movie, “Love me, if you can”, wherein she was nominated as best actress in the Golden Horse, though her acting was very raw, it was good & honest. I’m glad she’ll be doing movies again. I think she’s already proven her worth in dramas. As to her sentiments of being an “idol”, I don’t want her to be trapped in the “idol” roles too. I’ve seen her dramas from True Love 18 up to her present drama “In Time with You”, and she really has matured tremendously as an actor. I believe, it’s that time, in the phase of her career, that she explores the endless possibilities outside the “idol” world. And acting in a stage play last year & doing ITWY is a good start. Honestly, I think ITWY is really not a typical “idol” drama, and I’m glad she took the risk. Ariel loves acting and she’s very serious in her craft. So I admire her for choosing the path that will make her happy. Choosing roles that will make her a better actor and not limit herself to what can make her popular, but more on self development. I’m sure her fans will be mature enough to accept her in non “idol” like roles, as long as she’s happy. I hope she’ll be successful in movies as she takes time out from dramas. Love to see her do a movie with Zai Zai, Eddie Peng or other Mainland actors she hasn’t collaborated with. Oh, my ultimate dream is to see her act with Andy Lau or Sylvia Chang! OMG! It seems impossible, but who knows! And I think, that’s one of her dreams as well. I’m sure those who like Ariel, will enjoy & appreciate articles such as this. Thanks again! do you have the link to the FB page?